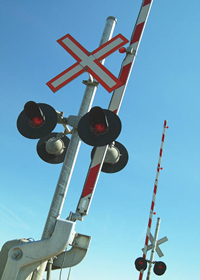 Whether as drivers or as pedestrians, people need to learn the rules of railroad crossings and bridges. A train's large size tends to make it seem to be going slower than it actually is. Freight trains can travel up to 60 mph while passenger trains can reach speeds of up to 80 mph. All that speed and weight make it impossible for a train to stop quickly. A fully loaded freight train can take up to a mile and a half before it can be brought to a full stop. Trains can’t stop fast nor can they swerve out of the way. All the railroad engineer can do is brace for the blow and, once he has brought the train to a full stop more than a mile down the track, report the crash and start filling out his incident report. Assume that there is a train on every track at all times, even tracks that are rarely used. If there is a stop sign at the crossing, stop! If there is a yield sign or electronic signals, slow and make sure that no trains are approaching. If there are two or more tracks, make sure there a train isn't coming in the other direction. The crossbuck railroad sign will indicate how many tracks there are at the crossing. When stopping at a railroad crossing make sure you stop no less than 15 feet from the tracks. Never cross a railroad track unless you are sure there is room on the other side for your vehicle to completely clear the tracks. Many collisions occur when a vehicle's rear end is still hanging out over the tracks. Don't shift gears while crossing a railroad track; it could cause your vehicle to stall. If your car stalls on a railroad track, get out of the car immediately, clear the tracks and call 911 for help. If a train is coming, run away from the tracks in the direction of the approaching train. If you run away from the approaching train, you may be injured or killed by flying debris when the train smashes into your car. Never try to beat a train at a crossing or snake around the lowered crossing gates. Once the lights start to flash and the crossing gate arms go down, the train will appear in about 20 seconds.